How to sum up a whole year, in images and stories? An Italian newspaper gave me an inspirational lesson today on the power of illustrated stories, to convey strong messages and reach out to the wider public. Objective? Give a fresh outlook and new perspectives - using comics as a reflection tool for the public opinion to shape ideas & drive transformational societal change. Italian Creativity always strikes me. 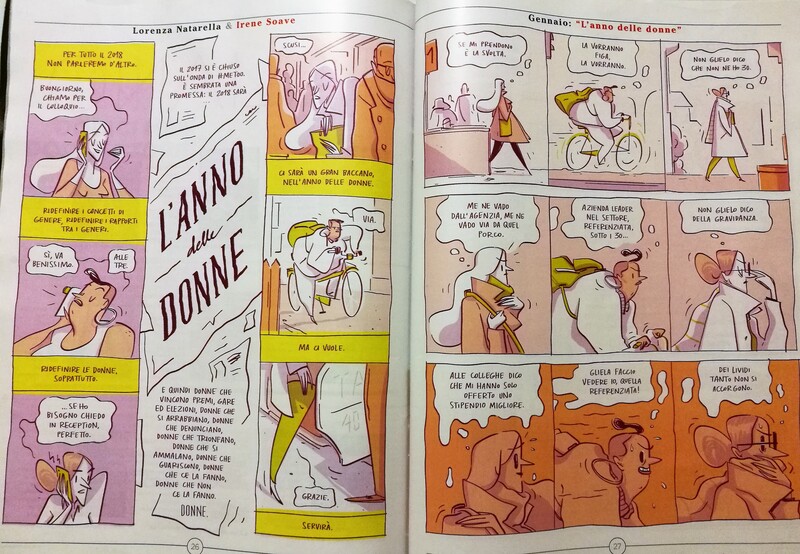 Today, with Il Corriere della Sera, the weekly magazine, Sette (seven, in Italian) published twelve graphic novels– a writing style of comics- where twelve journalists and twelve cartoonists joined hands to write and draw the twelve stories of the Italian year, one per month. The result gave an impressive and astonishing image of Italy in the Year 2018. What happened? How to convey the message, so that it reaches everyone – innovatively and thrillingly imprinting it in the minds of the public opinion? and, most importantly, how to make sure that the news become pieces of good information that readers can understand, process, digest and act upon, not leaving them only as memorabilia on the shelves? Why News? Why Information? How to use the Information? these are the three key questions of our civic and public life. According to the definition of the American Press Institute, “News is part of the communication that keeps us informed of the changing events, issues and characters in the world outside. The foremost value of news is as a utility to empower the informed“. The role of journalism is thus to provide citizens with the information they need to make the best possible decisions about their lives, their communities, their societies and their governments”. Comics can help in the process: I found that the originality of comics ( or now called graphic novel) allows readers to plunge into an illustrated story where they can easily associate with, making them see themselves, or a prominent story that they followed or heard in the year, with new and fresh eyes, brought to them by the innovative ideas & collaboration of newspapers and cartoonists. In this way, the readers can remember and reflect more on the stories themselves, thus feel empowered to act upon the stories (in the past) with a more proactive, positive and forward looking approach to change- improve- stand up & speak up for the issues worth fighting for, in the future. Let’s make intelligent use of technology: We make extensive use of smartphones, tablets, computers, online news, digital platforms, social media channels, videos. Technology is part of our lives nowadays. Let’s use it wisely, let’s be more Humans. Let’s give the right space to technology. Technology assists and supports human actions, it does not replace it. Therefore let’s give it the right space, without making it invade our own. Let us use our creativity and originality to read news in an alternative, fun and more entertaining way, always making sure it reaches our minds and it gives us the opportunity to act upon them. Let us not be mere receivers of news, but good analyzers of reality and wise human processors of information. 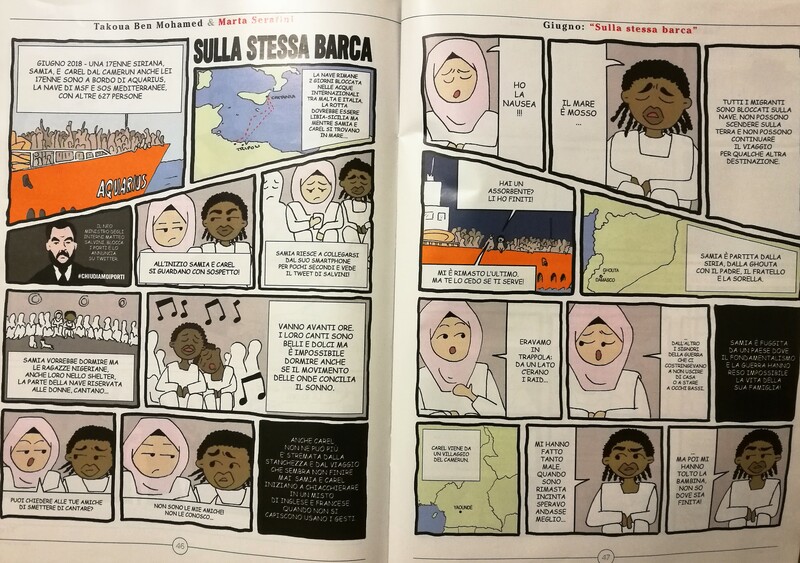 This year the Italian journalists-cartoonists touched themes of gender equality and women empowerment- following the global #metoo movement; they drew on the passive human behaviors of using technology and digital instruments as mere consumers of images; they discussed about the global and European migration, of Italian politics, of the importance of education for social progress..
You can see some graphic novels images in this post, but to read a few, you can check the complete year on the website of this Italian magazine, and read more on the incredible authors who made this a reality. Forcing us to think more of the present and of the consequences of it if we do not act now to correct and keep changing and improving the society we live in!